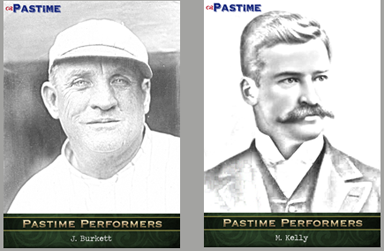 Pastime Cards, a new card company on the block, is following Leaf’s “Best of ...” business plan with the release of the 2013 Pastime Collection: Hall of Fame Signed Card Edition in mid-May. 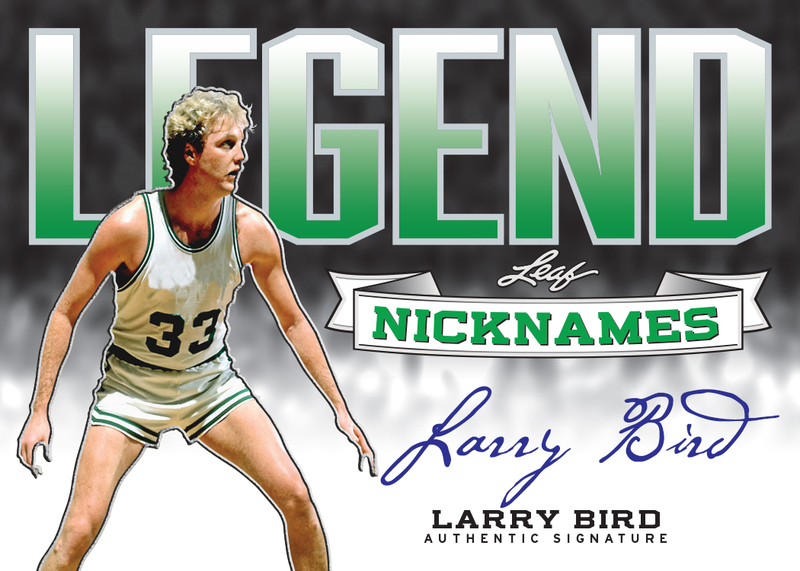 Each $250 box will include 7 cards; 5 Hall of Fame signed cards, one Pastime Performers card and one Pastime Points Program card. There will be only 100 boxes released and two of those boxes will be “Hot” boxes, a Mickey Mantle box and a Joe DiMaggio box. These boxes will contain 5 signed cards of either Mantle or DiMaggio. 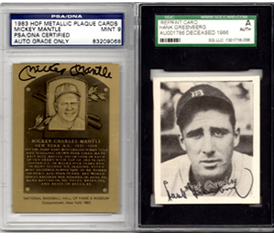 Each buyback card has been authenticated and slabbed, either in a magnetic holder and sealed with a gold sticker or slabbed by JSA, PSA, SGC or the original card company that issued the card. 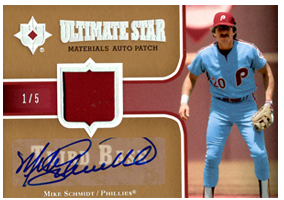 Some of the cards contain relics like a jersey or bat swatch. 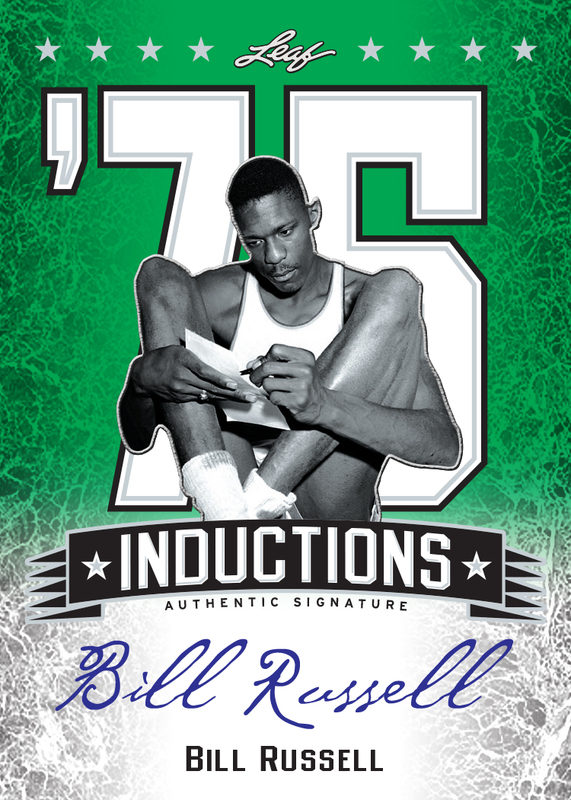 The checklist contains 141 Hall of Fame players, this may change before the product is released, but it includes super stars like Hank Aaron, Joe DiMaggio, Cool Papa Bell, Reggie Jackson, Mickey Mantle and Nolan Ryan. 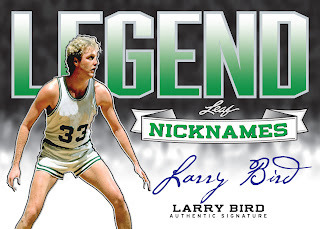 There are a couple of notable names missing like Babe Ruth, Lou Gehrig, Cy Young and Ty Cobb. 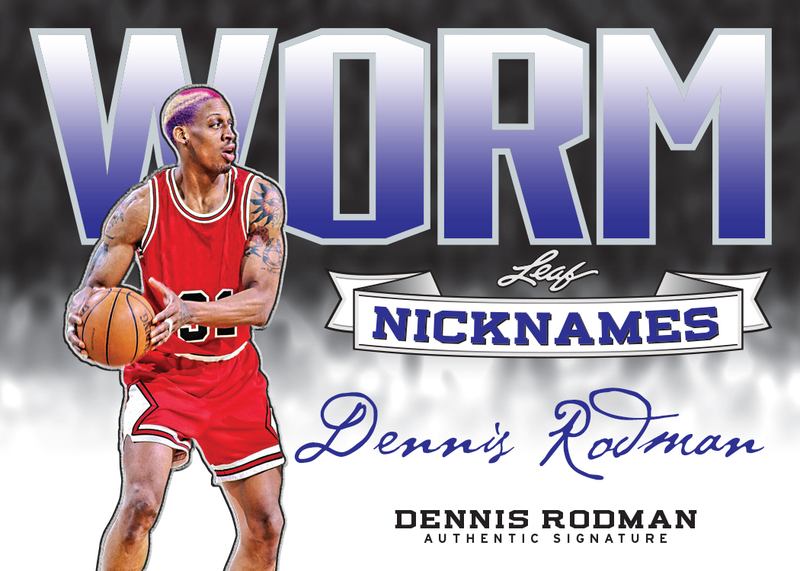 I am guessing that if their autographs were too expensive than they were left off of the checklist. 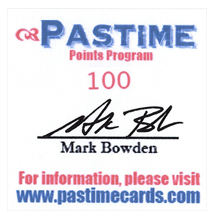 With this being Pastime Card’s first product release they probably do not have the cash like Leaf has at their disposal so they stuck with quantity to try to appeal to as many collectors as they can on the budget they can currently afford. 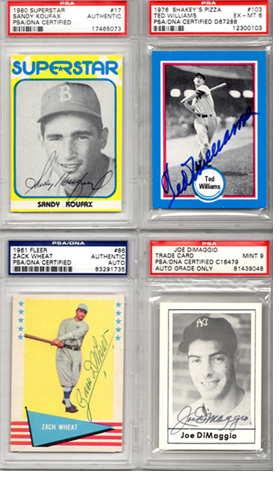 The 5 HOF signed cards will be random in the boxes except for the DiMaggio and Mantle Hot boxes. 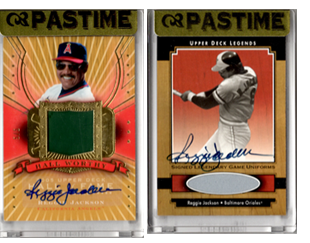 Each box will also contain one base card Pastime Performers, these cards are #/25 each. The checklist includes many of the HOF players from the early days of baseball in the late 1800s through the early 1900s. 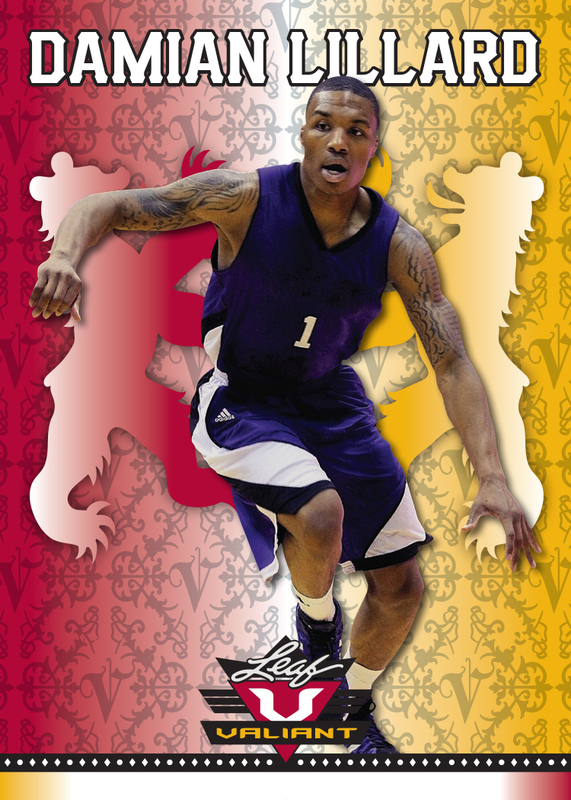 Players like King Kelly and Dan Brouthers. I actually like the design; unfortunately they were ruined by the use of these horrid images. 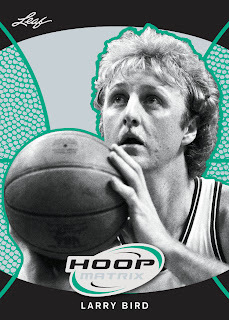 Had they used a simple black and white image the cards would have a classic look but instead they used images that appear to be manipulated by someone who finally got a chance to try out Photoshop. 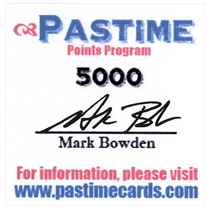 The final card in the box is a Pastime Points Program card. 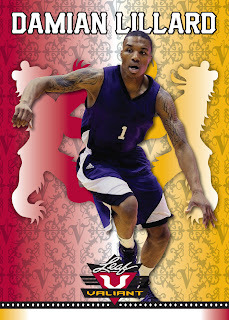 The cards will have a denomination from 100 through 5,000. It should be noted that their sales materials actually state two different denominations. One section says points inserted are from 100-2,500 but another section states points are from 100-5,000. 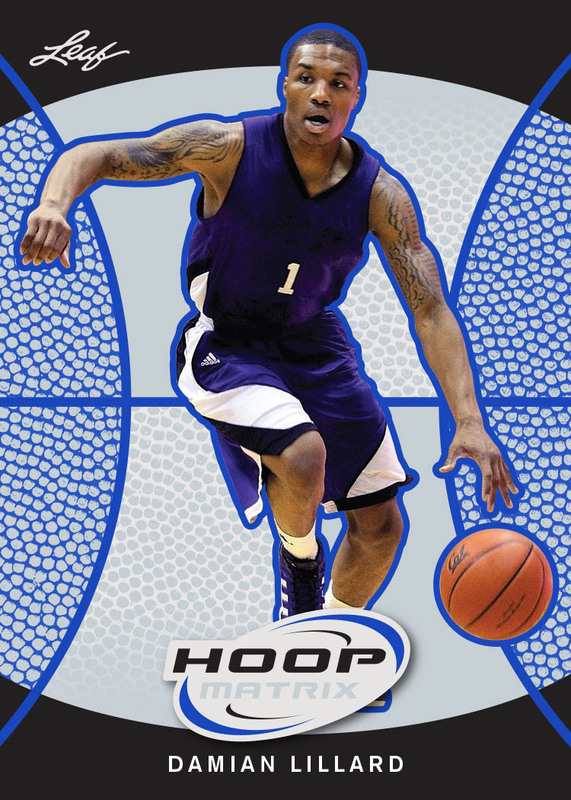 They also include an image of a 5,000 denomination card in the sales materials so I would assume that the 5,000 is the correct amount. These points can be exchanged for additional prizes such as signed 8x10 photos and signed baseballs. The player selection is random. 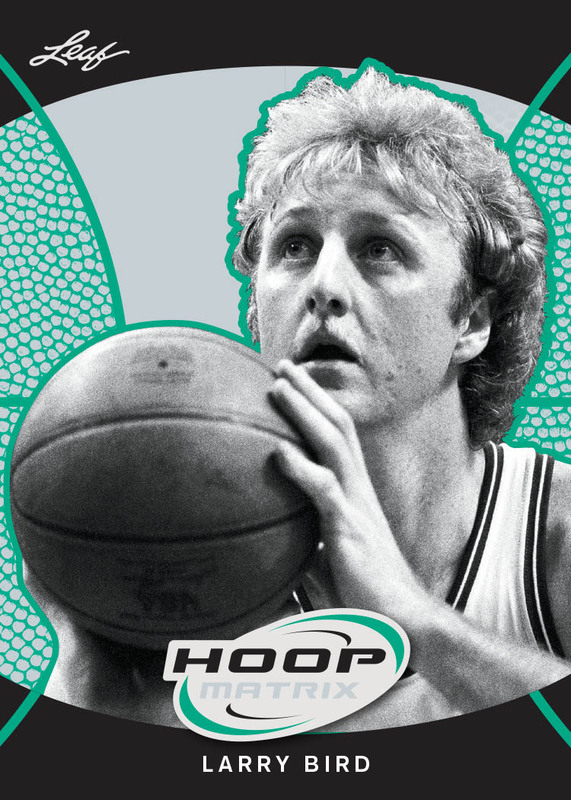 An added bonus is the redemption program; some boxes will include an additional card (8 cards instead of 7 cards) with the extra card being a redemption card. 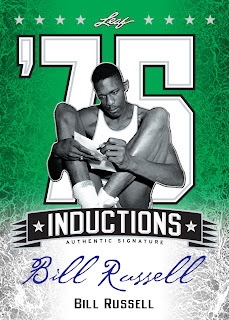 You scratch off the code and contact the company and you will receive another signed slabbed Hall of Fame card that was too large to fit in the box. 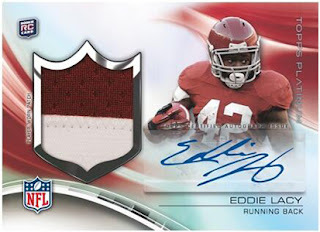 There are positives and negatives here, I know that some collectors have ripped Leaf for doing this and I am sure those same collectors will have the same thing to say here, but this gives collectors a chance at an autographed card from a Hall of Famer. The down side is that Pastime Card Company is a new company so people will have their doubts, at least initially, and dropping $250 on an unknown is a big gamble. I think if they were to drop the price to $75-125 range they would probably sell out pretty quickly, at that point I probably would consider buying in. I have always been a James Bond fan, besides the Star Wars trilogy there was nothing that grabbed my attention as a kid like a guy with a license to kill. This appreciation of a good spy flick has carried over in to my adult years. I think bringing in Daniel Craig has brought new life in the series that lost some of the wind in it sails after a tough transition in the 1980-90s where we saw three actors play James Bond in a 10-year span, though Pierce Brosnan did do a decent job during his 4 film tenure as 007. I am actually watching Thunderball right now as I am writing this post; EPIX is doing a Bond Marathon this month so I am in heaven. As a James Bond fan there is a large selection of collectibles, with 23 movies (25 if you count the 1967 spoof Casino Royale or the 1983 remake Never Say Never) to work with you have your choice of 6 James Bonds, 7 if you count David Niven in the spoof, a laundry list of Bond Villains and a dirty laundry list of Bond Girls. In the last couple of years Rittenhouse Archives has done an amazing job bringing the collectors closer to the films including hundreds of autographs and plenty of interesting and original relic/costume cards. 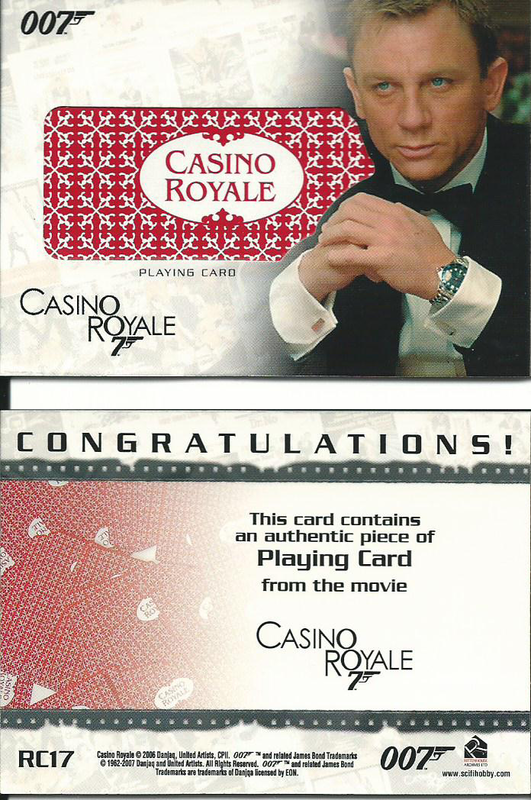 One of my favorite Bond pickups is from the 2007 Rittenhouse Complete James Bond release. 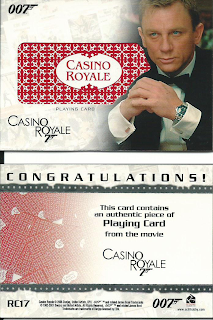 The set included autographs and relics from the 21 Bond films that had been released at that time and I was hunting for cards related to Daniel Craig and the Playing Card relic and Dual Tux Costume card were my target, along with a Casino Chip relic which has still alluded me. 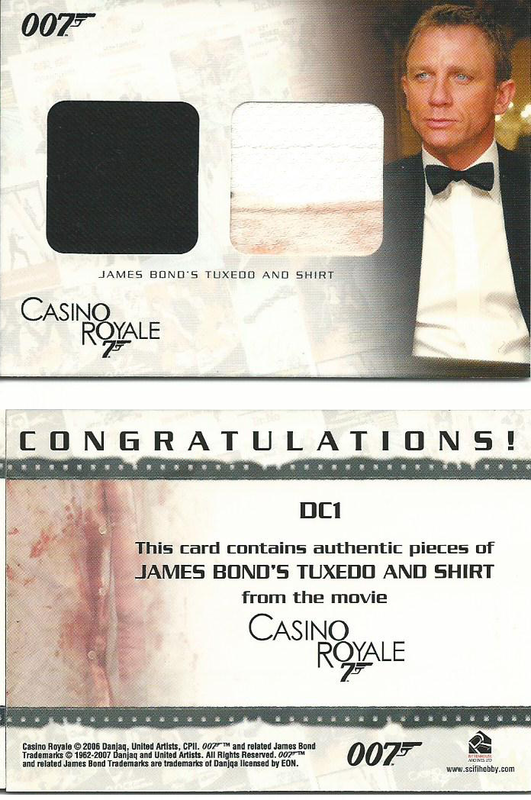 In one of the scenes in Casino Royale Bond is wearing a tux and he is bleeding, his shirt is covered in blood and this happens to be one of the shirts that Rittenhouse got to make their costume relic cards. 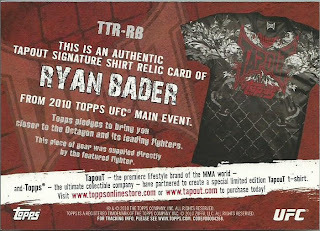 The relic cards that included a piece of the bloody shirt were premium pieces and cost quite a bit more, currently there is a bloody shirt relic card sitting at $129.99 while a relatively non-bloody shirt is at $39.99. I actually ended up getting both cards for around $30 shipped so I was pretty fortunate. The cards came in a rigid holder with a Rittenhouse Archives seal closing it in, but I removed the card. I have no intent on selling them and what is the point of having a relic card if you can not touch the relic? Fossilized lightning struck twice this month, for the second time in 3 weeks I was able to grab up an Upper Deck Fossil card, this time it is a Champ’s Museum Piece Trilobite Fossil. When the gavel struck I walked away with this for $25.75 plus $5 shipping from Canada. 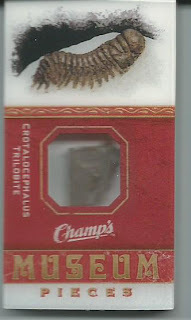 I could not believe that I found a fossil card for $30.75 shipped; I was over the moon on this one. It is a mini version, these things are so damn cool, and it came in the original shipping case that it came in from Upper Deck. It is almost double the thickness of the Auroch Fossil card and it is quite heavy for its size. 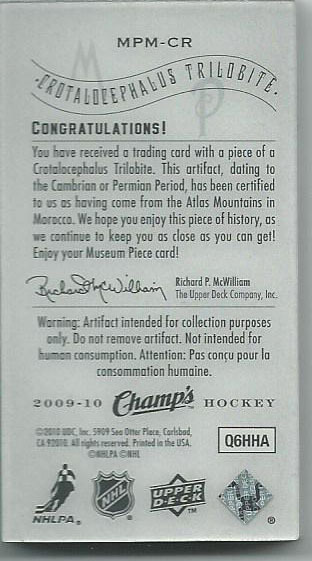 When I scanned the card I could not get the scanner lid to close completely so light was let in and the fossil looks blurred out, it does not look like that in your hand. The etchings in the red around the fossil and the “MUSEUM” name are part of the design, not damage. 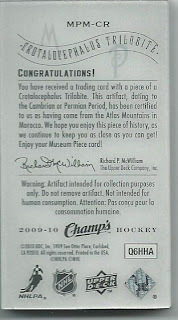 I am still hunting down an Entomology card and Museum Piece card; I also hope to add a Landmark card some day too. 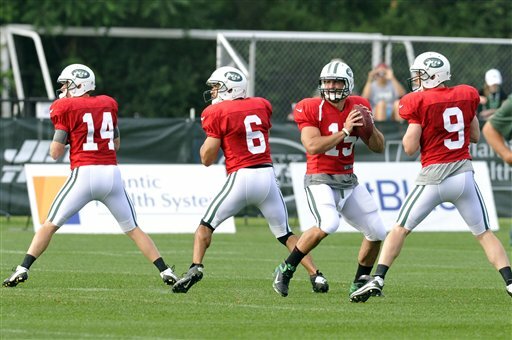 Three weeks ago I wrote a follow up post to the original “What Could Go Wrong…” detailing what eventually did go wrong with the Jets creating a media circus when they brought in Tim Tebow. I closed the post by jokingly suggesting that I could turn this story in to an annual serial covering the destruction that comes from Woody Johnson’s circus. Little did I realize at the time that I would actually be writing a second “What Could Go Wrong…” following the NFL Draft. Even though the Jets have serious needs to rebuild the team, Johnson and GM John Idzik decided to once again add a quarterback to their roster. How do you make a grease fire worse? You throw water on it or in this case add another player to an overloaded position. I kind of feel bad for Geno Smith, the kid got ignored yesterday and this was after some early mock drafts even had his as high as #1 pick, but then he gets drafted by the Jets. How could he make things any worse? 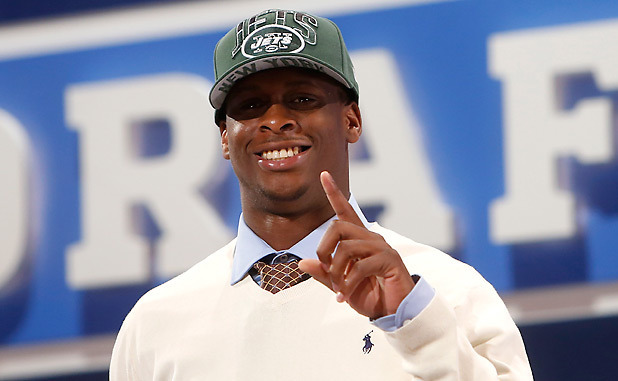 In his first interview as a Jet he takes a page from his dumbass coach Rex Ryan and says "We're going to make the playoffs." Personally I feel that if this was a situation where Gerrard had the reigns and McElroy and Smith were the backups I think that Smith could have taken a year or two under Gerrard before taking over as the franchise leader but there is no way this will happen as long as Ryan is still the coach. Is there any way that this scenario does not end in someone losing their job at the end of next season due directly to these personal pickups? Labels: Commentary, NFL Draft, NY Jets, What Could Go Wrong? Many experts have been talking about the lack of skilled position players in this year’s NFL Draft. This was projected to be an O-Line heavy draft and that turned out to be pretty accurate with 9 of the 32 picks being O-Line players, a tone that was set with Offensive Tackles being taken at the #1, #2 and #4 positions. Toss in the 8 Defensive Lineman and 3 Linebackers and it seemed like the skilled positions were pretty weak overall. By the time Baltimore took Florida Safety Matt Elam with the #32 pick we saw 3 Wide Receivers, 1 Quarterback and a Tight End grace the board. This was the first draft in 50 years since a Running Back was not selected in the first round. Of course draft position is not an automatic signal of how well a player will do in the NFL but it usually is a sign of how well you did in college. Draft experts are lucky to be correct 50% of the time…if even that. Two experts of note, ESPN “Draft Guru” Mel Kieper, based on his final mock draft released this morning, ended up getting 6 players correct (player on the correct team or draft position), that would be 19% correct while NFL Network’s guru Mike Mayock did a bit better with 9 players correct, 28% correct. For some reason ESPN’s Chris Berman and Mel Kieper are HUGE on Manti Te’o. Beginning with the New York Giant #19 pick the words “These are the Manti Rounds” seemed to flow from their mouths every time their lips were moving. These two predicted Manti Te’o would be drafted by the Giants (#19), Bears (#20), Vikings (#23 and 25), Packers (#26) and Ravens (#32). How far where they off? Only one linebacker was selected between #19 and #32, Olgetree by the Rams. 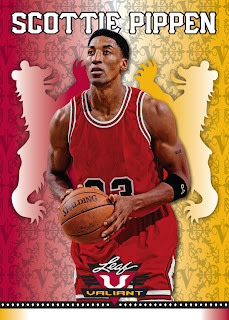 I found myself actually rooting for teams not to pick him purely based on how much they were promoting him and his upside. Not sure what his upside really is though. Ignoring the girlfriend hoax, that has been played enough; he disappeared against Alabama’s offense in the Championship Game. Yes he had 3 solo tackles and 7 assists but Lacy seemed to glide right past Te’o on his way to 140 rushing yards not to mention Bama’s O-line manhandled him and he missed a number of tackles by choosing bad angles on the ball. 40 yard dash- 4.82 seconds, linebackers are expected to hit 4.70 or under. Field Drills- He was stiff in the shuffle drill but looked better in drop back and shuttle. Essentially he is about average for a linebacker, which is fine, and he will probably end up being a late Second Round or early Third Round pick but anyone entertaining him as a First Rounder was probably blinded by his success during Notre Dame’s undefeated season and not looking at the long run. 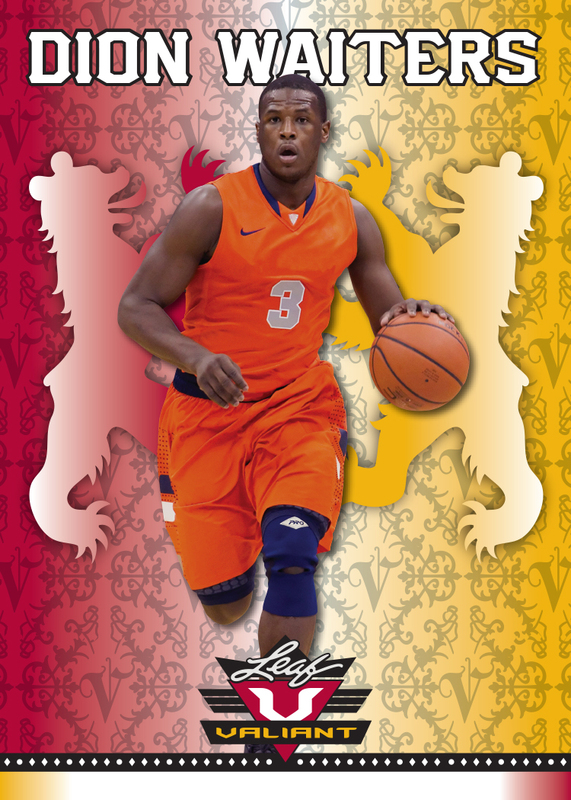 Finally I think whichever team does draft him they will need to consider the elephant in the room when he first walks in to the locker room. Agree with it or not, he will be targeted by some players for his girlfriend fiasco no matter how it is sliced and if he ends up in the wrong locker room (poor leadership or a media circus) he could end up getting picked on or mentally abused which could affect his play and career. Imagine walking in to the New York Jets locker room, no player leadership, an oblivious coach and owner and a collection of misfit toys that openly and anonymously rip their team mates apart, he would probably follow the same route that Tebow had to deal with last year and you know that Tebow is probably more secure in himself and his playing ability when compared to Te’o. Personally I would like to see the kid end up on a team with good coaches and a decent veteran squad who will work with him and help him through the transition. 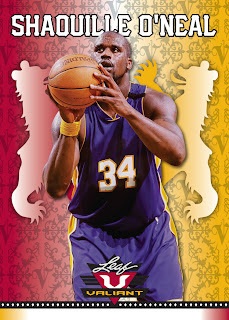 He may not have a Ray Lewis or Brian Urlacher career but with support and training he could be a solid anchor. 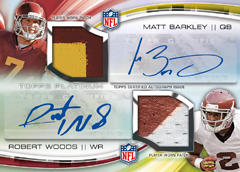 When it comes to Topps and Panini, they are going to have a difficult time promoting upcoming products using this year’s draft class. Jaguars, Vikings and Dolphins Oh My! 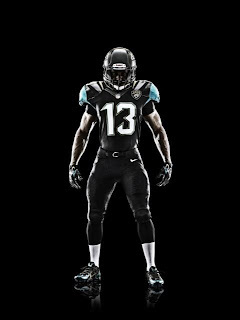 Yesterday the Jacksonville Jaguars released images of their new uniforms through their Twitter account. 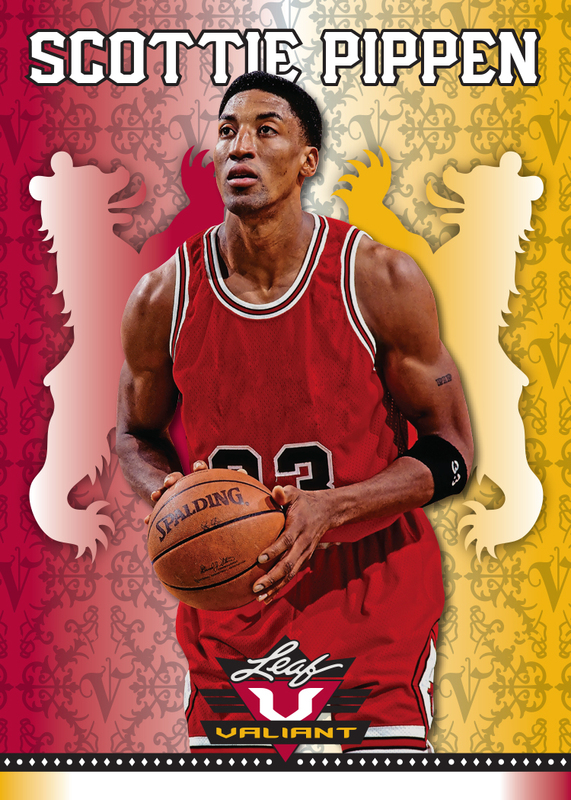 The jerseys have changed quite significantly. 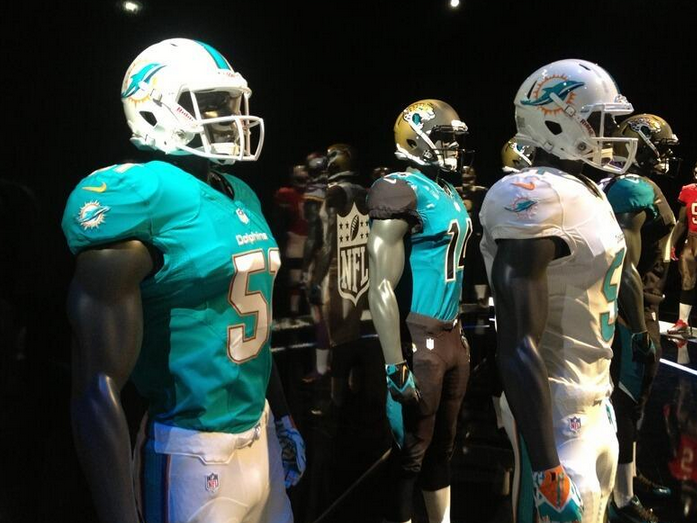 They have three different jerseys- Home, Away and a Teal Alternate. 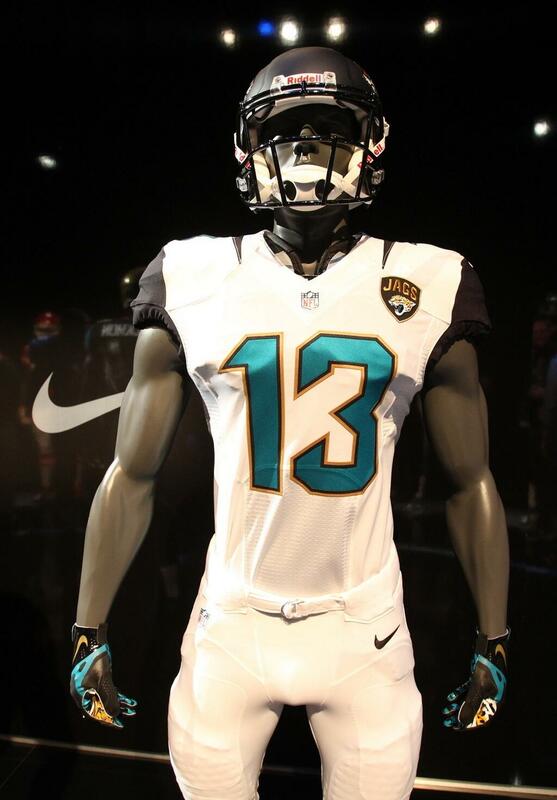 The sleeves are a different color from the jersey and there is a swoop (gold or black depending on the jersey color) across the shoulders from back to front. 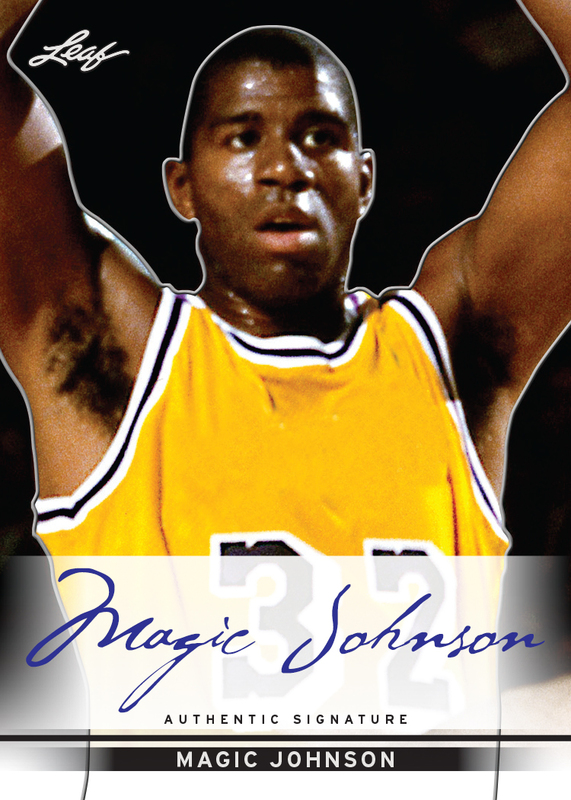 The numbers have changed font and include a multi-colored stroke based on the jersey color. 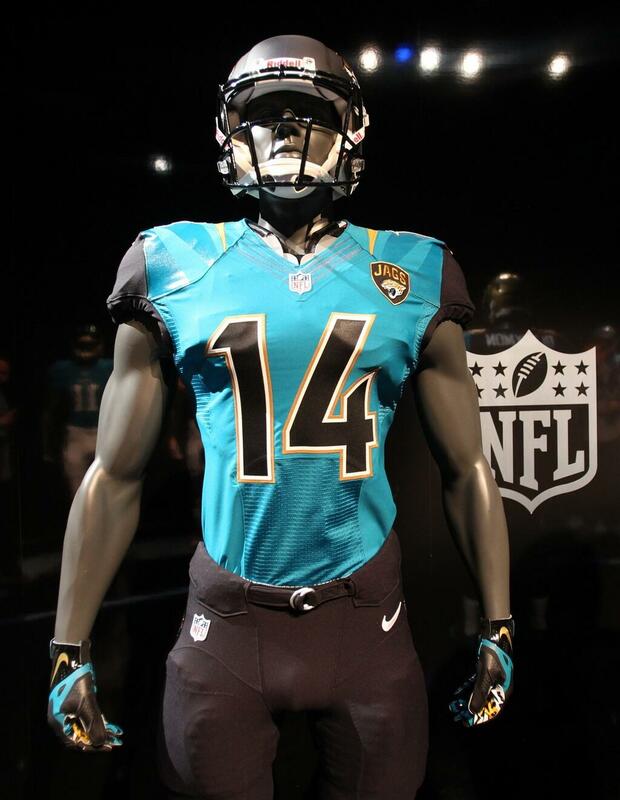 A "JAGS" patch, with the new Jaguars logo, is located on the upper left chest. 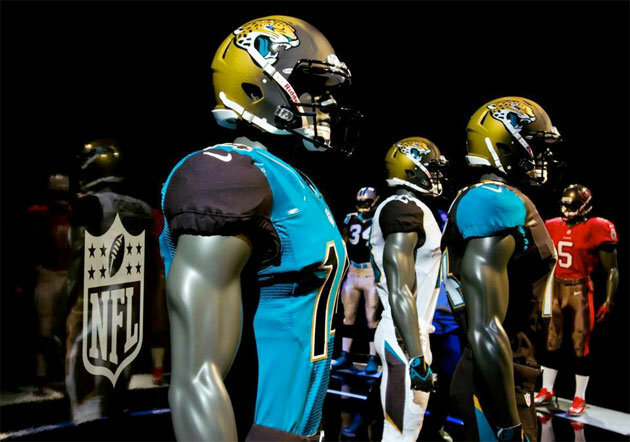 The helmets are the biggest change, they are matte black on the front and gradate back to a glossy gold with the new jaguar logo on the side. I honestly do not know how I feel, I kind of like the look but the different color shoulders remind me of an Arena Football team’s jersey. The helmets will take some getting used to over time. 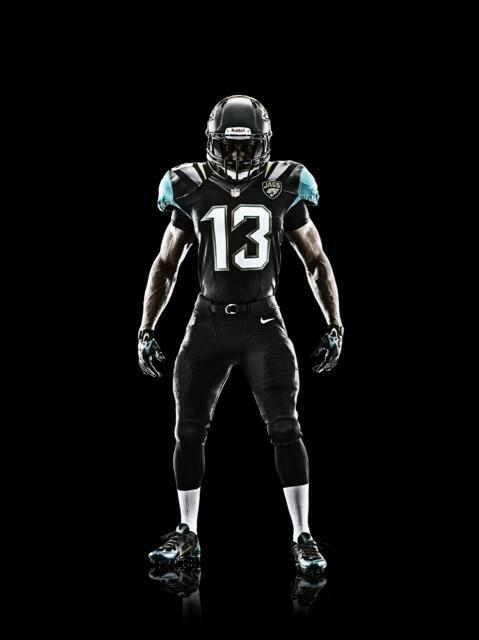 I am also guessing that the uniforms can be varied up over the season by switching up the jersey and pants. It would be cool to see one of those new "JAGS" logo patches included on a card, unfortunately they to large to fit on to one card unless it was an over sized box topper or maybe a booklet card. The Dolphins and Vikings are changing up their uniforms too. The Vikings had planned on unveiling the new uniforms tomorrow. It was expected the Dolphins would change their uniforms when they announced the new logo but they had not scheduled an unveiling for the new uniform yet. 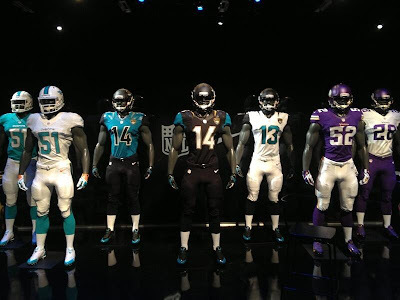 The images of both the Dolphins and Vikings new uniforms were inadvertently released on the Internet by a Jacksonville television station (Action News Jacksonville) who was carrying a story on their web site about the Jags new uniform. 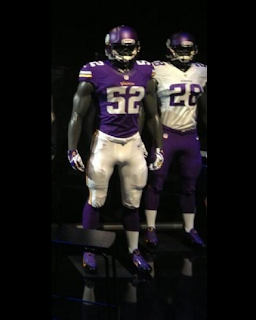 The pictures of the Dolphins and Vikings have since been removed from the televison station's web site but not before ESPN writer Paul Lukas, who runs the web site Uni Watch, found the pictures and posted the images of the new uniforms last night. 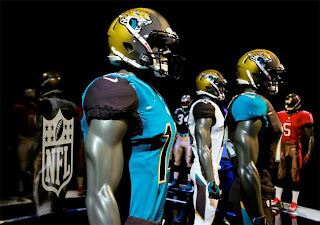 What is your take on the uniform changes? 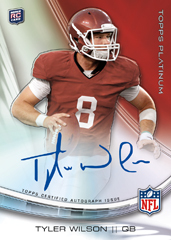 The 2013 NFL Draft begins Thursday so Topps is taking advantage of the attention and they have begun releasing information for the 2013 Topps Platinum Football set that is set for release later this year, around September 4th. 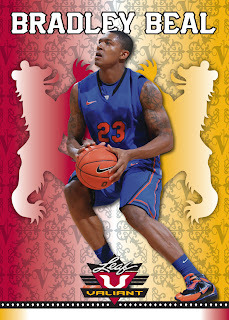 Boxes will be running $90-95 and they will contain 20 packs with 5 cards per pack. Each box will include 3 hits, 2 autographed rookie cards (on-card autos) and an autograph rookie refractor patch card, plus a Black Refractor rookie card parallel. 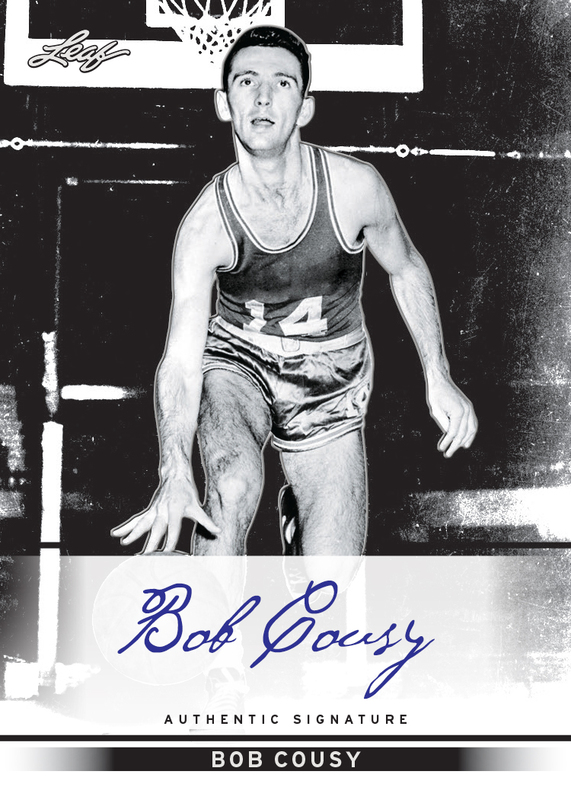 The base set is made up of 150 cards, 100 veterans and 50 rookies. 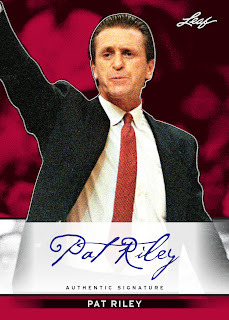 There are parallels for the base cards too; the veterans only have one parallel version while the rookies have 9 parallels. ﻿﻿ There are a handful of relic cards, there will be one Rookie Refractor Patch card per box but the rest are a bit more difficult to pull including the Platinum Rookie Jumbo Patch Chrome Refractor which is a case hit. 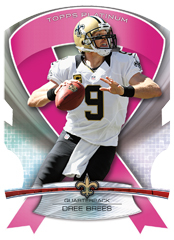 Inserts also include the die-cut Breast Cancer Awareness Ribbon card and the die-cut Military Support Ribbon card and there will be autographed versions of each die-cut. Some of the bigger hits are; Dual Autographs (#/25), Hexgraphs (#/10), Dual Autograph Dual Patch (#/25), Dual Autograph Rookie Refractor Jumbo Book cards (1/1), Autographed Refractor Platinum Patch card (#/5) and finally the Platinum Rookie Jumbo Patch Chrome Refractor case hit. 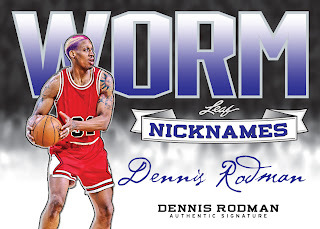 An interesting redemption card is for the Uncut Sheet Redemptions which are good for an uncut sheet of the base card checklist and includes X-Fractor, Black Refractors and Sapphire Parallels. 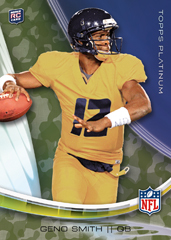 ﻿ One thing to note, Topps has stated that the rookies are shown in their college uniforms for the promotional material only, they will be pictured in their proper NFL uniforms when the product is released in September. 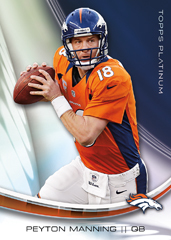 I will admit it, I love the Platinum sets so I am withholding a rating because it would be biased towards the release. The last couple of Platinum releases (baseball and football) I have been satisfied with picking up packs and blaster boxes but I am considering going with a hobby box this time. 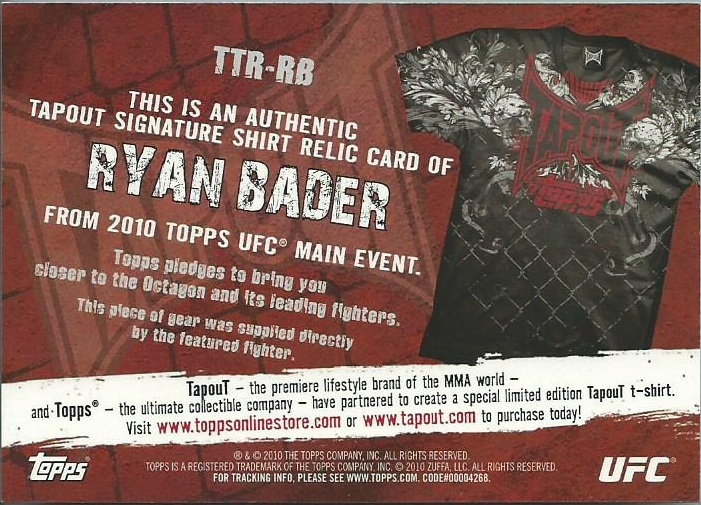 In 2010 Topps decided to build on their new UFC license following the super popular 2009 Topps UFC Round One and 2009 Topps UFC Round Two releases. They released three sets in 2010, Main Event, Knockout and Series 4, all quite popular in their own right. One of the inserts from Main Event that has really grabbed my attention was the TapouT relics; I am not sure why I am so drawn to the insert. Some collectors might look at the design as overburdened and hodge podge and possibly even down-right ugly and I have to admit that there really is a lot going on here. Between the fighter, name, UFC/WEC logo, TapouT logo, various designs and images, the “Authentic…” text and finally the relic it really is one cluster of a mess but none the less I love the insert. There are always plain black relic versions available, not to mention Sean Sherk and Mike Brown cards, but the multi-color relics are difficult to find for some of the bigger name fighters. 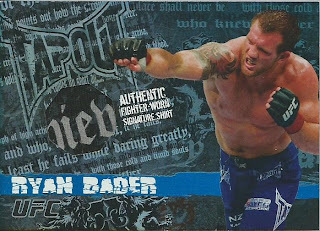 I have been hunting for a nice Bader card for a while and when this copy showed up I was torn, it was a bit more expensive than his plain relic versions and even a couple of dollars more than an Onyx #/88 copy for auction but because the swatch included text I finally gave in and used the $9 BIN price. I am sitting on the fence on picking up the Bader Onyx copy too but I felt that this one was my first target and I could not be happier. 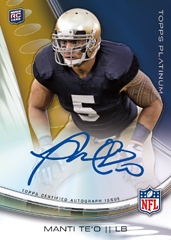 The other day Leaf previewed their new Matrix technology, an etched refractor like coating that gives the card an original appearance. The first set that will include Matrix inserts will be the 2012-13 Leaf Metal Basketball set, which is scheduled for a May 21 release. 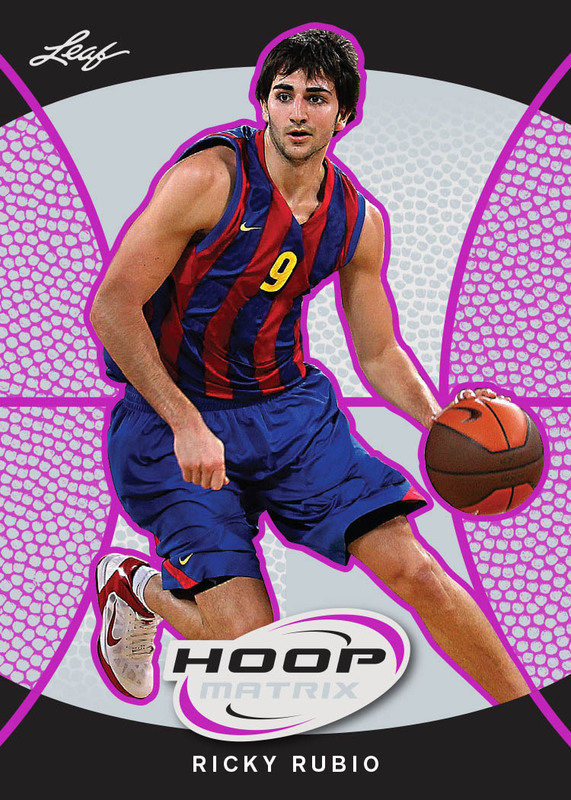 The set will be made up of retired players as well as a selection of young/up and coming players. 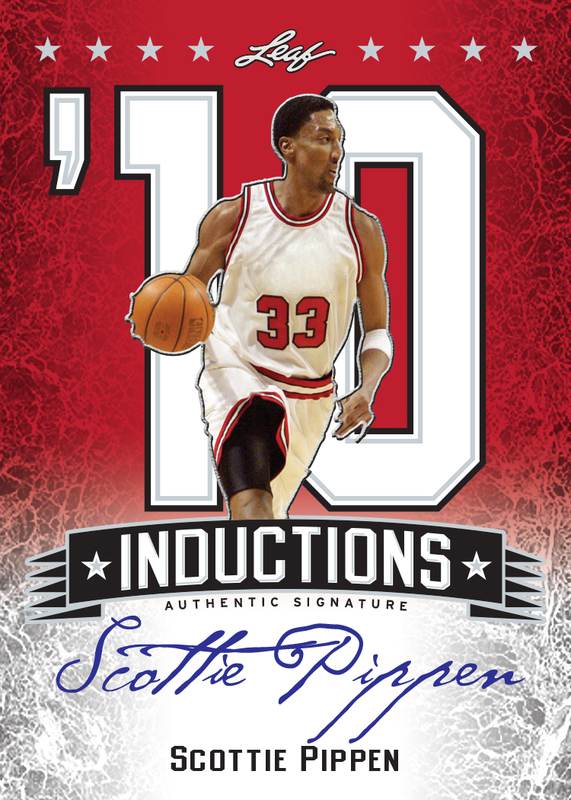 Each $180 box will include 5 packs (2 cards/pack) and each pack will include one on-card autograph and one insert. 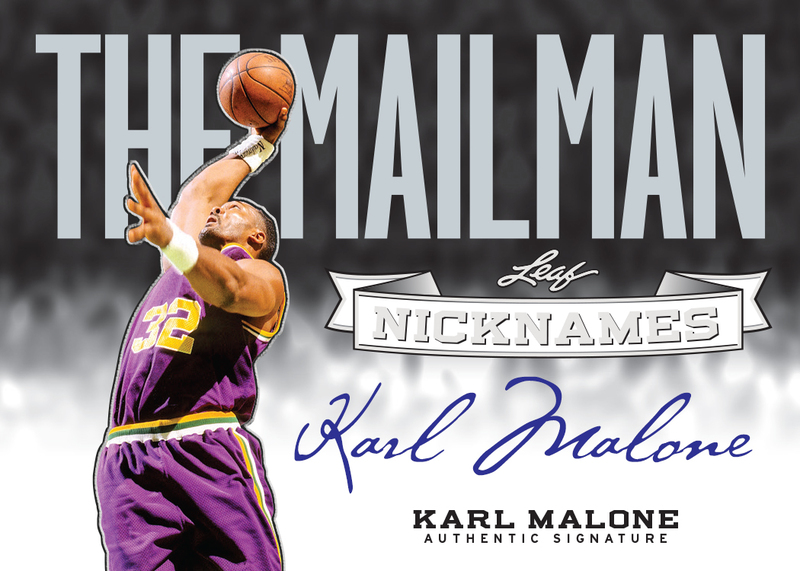 Some of the names included on the autograph checklist include retired players like Patrick Ewing, Magic Johnson, Shaq and Karl Malone and young players like potential ROY Damian Lillard. 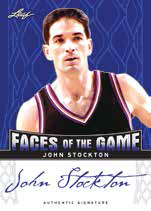 The autograph insert list is made up of a nice variety to keep it interesting and includes; base autographs, jumbo patches autographs, Hall of Fame Inductions, Nicknames and Faces of the Game. 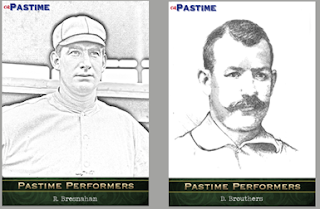 There are also colored and prismatic parallels of certain inserts like the base autos and HOF Inductions though I am not certain if they are numbered or the break down. 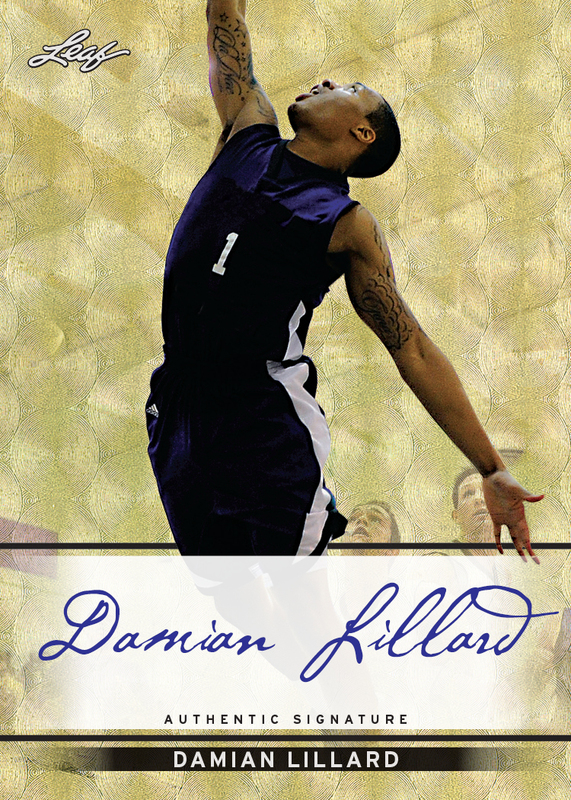 Valiant and Hoop Matrix are part of the insert list too, though those are not autographed. Being an unlicensed product all logo and team names have been removed and in some cases it is noticeable, like with the Magic Johnson base auto. A number of players are pictures in either college jerseys or foreign jerseys when applicable. 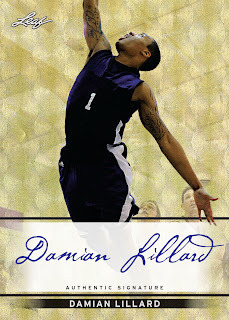 I noticed that Lillard was pictured in his Portland Trail Blazers uniform on the Hoop Matrix card that Leaf used during the announcement this past week but he is pictured in his Weber State uniform in the Metal Basketball announcement. 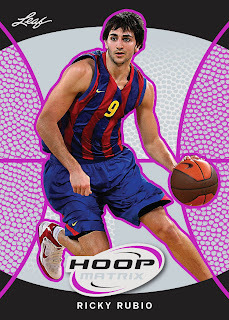 I am not sure if this is an oversight or if he has different cards in the release. 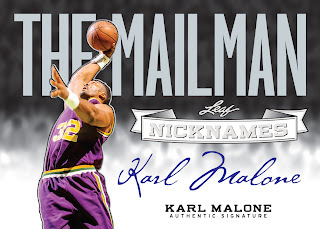 Personally I like the release, the box price is more than I am willing to pay but I may buy a pack or two (roughly $36/pack) or pick up some singles when they hit the market. 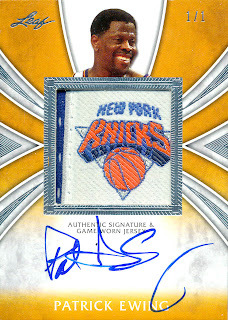 There are some very big names included in the set with Patrick Ewing leading the way. Apparently he appears in less than 20 autograph checklists and with his last auto being released about 10 years ago so you figure there will be people chasing his cards. 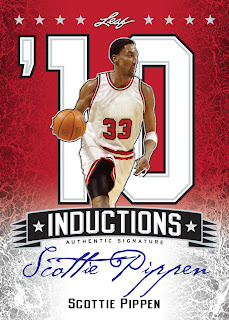 I think Pippen, Cousey and Russell will also be big draws. 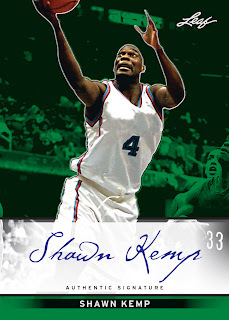 I am disappointed that Leaf chose to use a picture of Shawn Kemp in a Cleveland Cavaliers uniform instead of a Sonics uniform. 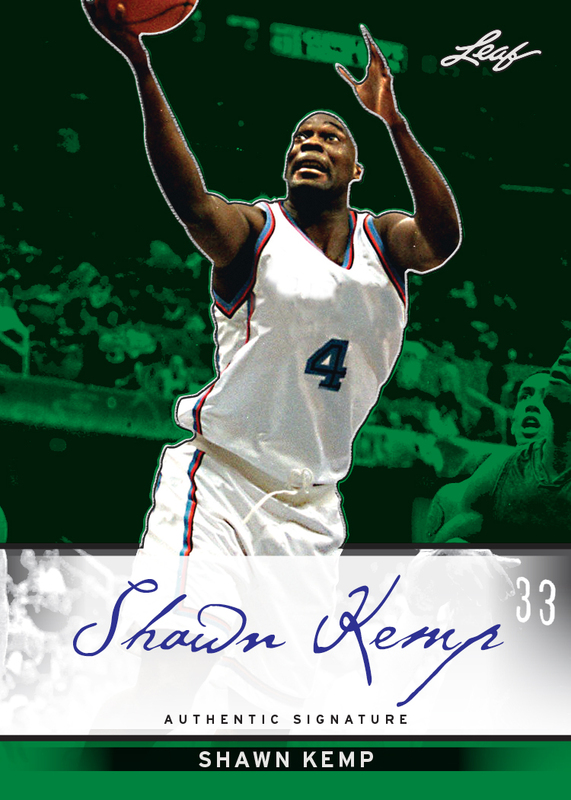 The Reign Man is best known for his Supersonics years… and for having a ton of kids.